Clinicians agree that women with dense breast tissue are at higher risk of developing breast cancer, and their breast cancers are more likely to be missed by a mammogram. Research shows that mammography fails to detect up to 35% of breast cancers in women with dense breasts. But that’s where the agreement stops and the debate begins. Dense breasts contain less fatty tissue and more nonfatty or fibrous tissue than breasts that aren’t dense. The problem is that both dense breast tissue and spots or lumps, whether malignant or benign, appear white on X-rays. That’s why finding cancers on mammograms of women with dense breast tissue sometimes is likened to finding a snowball in a blizzard. Women can have very to moderately dense breasts or fatty breasts. Additionally, women can have breasts that are dense all over or only in some areas and not others. Fourteen states now have laws requiring that women who undergo mammograms be informed when they have dense breast tissue, and a national law concerning such notification is a growing possibility. While radiologists agree that breast density is a risk factor for cancer, they disagree over the best way to determine a woman’s breast density and follow up with her if they believe she has dense breasts. To help standardize the description of breast density, the ACR has devised a four-level scale as part of its BI-RADS, the latest version of which was released in early February. The new version no longer specifies area-based percentages of density but instead stresses volumetric assessment of density. The new breast composition categories are almost entirely fatty, scattered areas of fibroglandular density, heterogeneously dense, and extremely dense. Women with breasts that are heterogeneously or extremely dense may be told they have dense breasts. About 10% of women have fatty breasts, about 40% have fibrograndular densities, and about 40% have heterogeneously dense breasts, which may obscure the detection of small masses. About 10% of women fall into the very dense breasts category, the group most likely to have cancers missed by mammograms. Most radiologists estimate breast density based on their visual judgment of a mammogram and then assign a classification. “That’s tricky because radiologists are not always in agreement where a particular patient’s breasts might be judged to be,” says Alan Semine, MD, chief of breast imaging and medical director of the Auerbach Breast Center at Newton-Wellesley Hospital near Boston. However, he says most health insurance plans won’t cover additional screening exams for women who fall into one of the higher-density categories, so he believes telling them they are at higher risk of breast cancer because they have dense breast tissue can be unfair. Regina Hooley, MD, who specializes in diagnostic radiology at Yale Cancer Center in New Haven, Connecticut, says judging breast density by reviewing a mammogram is straightforward in most cases. But if a woman is borderline—if she falls between 49% and 51%, for instance—the decision whether to call her breasts heterogeneously dense can be a little more difficult, she says. Before the system was installed, Weigert says different radiologists could look at the same mammograms or those done on different machines and reach different conclusions about density. “We thought it important to have something that was objective,” she says. VuCOMP, of Plano, Texas, uses an appearance-based approach to assess breast density. At RSNA 2013, VuCOMP introduced M-Vu Breast Density to assist radiologists with evaluating women’s breast density. M-Vu Breast Density uses advanced computer vision algorithms to evaluate the appearance of structures and textures in a mammogram to differentiate between fatty and dense regions, explains Jeff Wehnes, VuCOMP’s president and CEO. The algorithms calculate a percentage of the breast area that’s dense and converts it to the corresponding BI-RADS category. 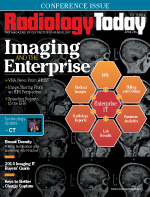 Weigert believes that using the Volpara automated volumetric density tool helps ensure that women who need supplemental imaging receive it, so “that the right patients will come back for additional imaging,” she says. Experience also has helped physicians determine who needs further screening and who needs biopsies, Weigert says. In 2009, when Connecticut became the first state to enact a law requiring that mammogram reports include a woman’s breast density, physicians likely were ordering many more biopsies based on screening ultrasounds in women with dense breasts than were necessary, she says. “There was a learning curve to this,” she says. After five years, radiologists can read the screening sonogram and decide to watch and wait rather than do a biopsy, Weigert notes. Studies have found that ultrasound screenings find an additional 3.2 cancers per 1,000 patients screened, which she says is significant. Also, the cancers found on ultrasound screening often are small and more invasive and thus can benefit greatly from early detection, she explains. Semine believes that a woman’s breast density needs to be kept in perspective. Breast density is a factor in a woman’s cancer risk and shouldn’t be used independently to determine whether she could benefit from additional cancer screening, he says. “I believe that figuring out a way to use quantified breast density and integrating it into a patient’s risk profile will have more value than just breast density as a stand-alone measure,” he says. Semine says he would be more interested in using breast density assessment software if he could integrate the numbers into a more complete picture of a patient’s risk rather than as an end point. He argues that it’s unfair for the law to require a radiologist to tell a woman that she has dense breasts and may be at greater risk of breast cancer and then she finds out her insurance won’t pay for additional screenings that could put her at ease or uncover an unsuspected malignancy. If women with dense breasts must pay out of pocket for ultrasound screening, those who can readily afford it may want to do it, while those who can’t often won’t pursue it, he says. Also, telling a woman that she doesn’t have dense breasts can be misleading, according to Semine. “She might think, ‘Thank goodness I don’t have dense breasts.’ But it can be false reassurance if the rest of her profile suggests she might be at risk,” he explains. Women have other options as well, according to Semine. His practice uses 3D digital tomosynthesis, which provides images with higher diagnostic detail compared with conventional 2D digital mammography. “We have adopted tomosynthesis across the board for all our patients,” he says. As a result, Auerbach Breast Center’s detection rate of noninvasive ductal carcinoma in situ has remained constant, while its detection of invasive cancers has almost doubled. MRI also has proven to detect more cancers earlier in women with dense breast tissue than mammography or ultrasound, Semine notes. But as a screening tool, MRI is much more costly and if insurance won’t cover it, it’s an option only for women who can afford it. Screening and diagnostic ultrasound aren’t the same, Linver notes, and physicians will need to learn to interpret them differently. “With screening ultrasound, you don’t go after the subtle nuances like you do with mammography. You have to learn to ignore the probably benign stuff and go for the low hanging fruit, the likely cancers.” If they don’t, he says, they’ll be doing biopsies too often, with an infinitesimal cancer yield and an unnecessarily high financial and emotional cost to the patients. Like Weigert, Hooley says, with experience, radiologists have come to accept the new paradigm and not go overboard with frequent follow-up exams and biopsies. They’re accepting and open to the idea of reporting breast density, she says, because they are detecting more cancers earlier when they’re most treatable. — Beth W. Orenstein, of Northampton, Pennsylvania, is a freelance medical writer and regular contributor to Radiology Today.